This was extremely exciting news for our family. It would be my parent's first grandchild and I was going to be an Auntie to this little angel! 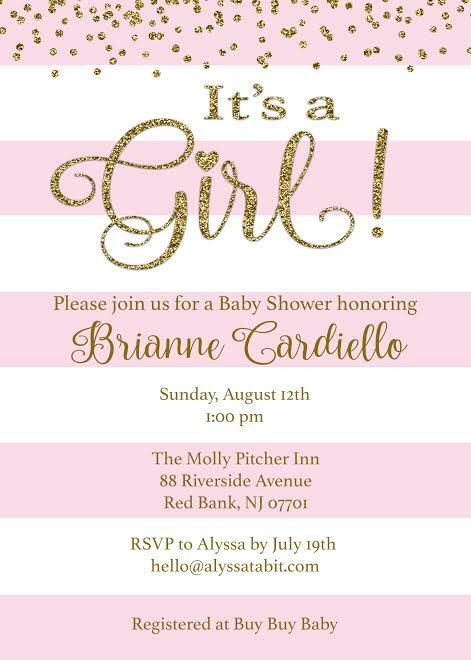 Brianne and Jim would name her Juliana Marie (her middle name after mine - insert tears emoji here) & I knew I wanted to throw my sister a shower that was just as special as she. 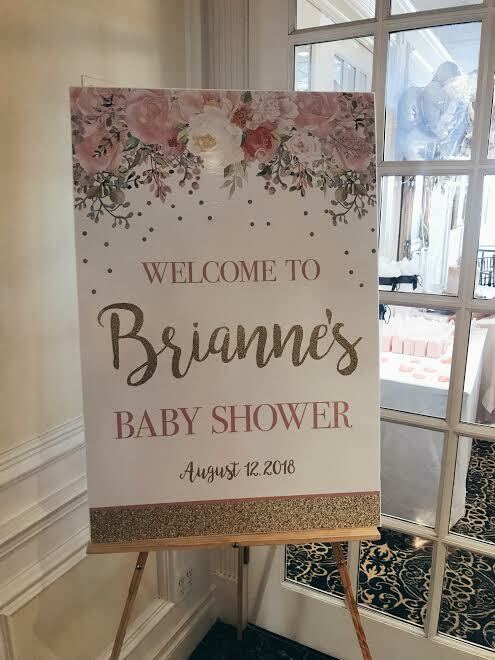 As June rolled around, my mom and I began connecting about Bree's shower. She mentioned the idea of an event planner and I immediately thought, "No way, we've got this." I started pinning a ton of ideas for the shower on Pinterest. I wanted a very specific theme and look to match Bree's personality and style. I wanted this to scream Brianne. It all started with invitations. We found a girly & chic design that Bree fell in love with. I gathered all of the addresses and printed out the invitations at a local print shop in Pasadena. From there, I spent an evening sending out about 70 invites and was so excited to hear back from the guest list! Our end guest list included 25 people. We were set for Sunday, August 12th at The Molly Pitcher Inn. I arrived at The Newark Airport on Friday evening and spent all of Saturday prepping for Bree's big day before heading to a delicious Thai dinner in Asbury Park. My Mom, Aunt and I went home and put the finishing touches on the gift bags and presents that needed wrapping. One more sleep and then it was the big day! My Mom, Aunt & I packed up the car and off I went to grab the Bluetooth speakers (funny thing, we never ended up using them as they had music there!) I arrived at The Molly Pitcher Inn at about 12p and was greeted by our FABULOUS Maitre d', Paul. The bellhop helped unpack the car, the flowers were delivered and before I knew it, the room was ready to go! We had one major problem, however; it was 12:30p and the cake still hadn't arrived. The shower began in 30 minutes! Every minute that passed I was waiting (impatiently lol) for the bakery to call me back. At this point, we had 29 minutes until the shower started and our cake was nowhere to be found! I took a few deep breathes and told myself it would all work out. A minute later, the bakery called and said someone would be there in five minutes. FINGERS CROSSED. As I finished dressing my sister's chair, I heard someone say, "Alyssa?" I turned around and it was the cake! Phew! We took it out and set it up on the cake table and boy, was it worth the wait. The cake had turned out just sensational. Shortly after the cake was delivered, our guests began to arrive. Everyone was greeted with smiles, hugs and of course, mimosas! We were all excitedly waiting for the woman of the hour! Bree texted me to say she was almost there and we all got ready for her arrival. The look on Bree's face when she walked in, made all of the planning completely and totally worth it. Through tears of happiness, she hugged everyone and thanked us all for being there. As she settled in, our Maitre d', Paul got the crowd pumped to celebrate Brianne and introduced me to say a few words and give a toast. From there, we enjoyed delightful quiches, salads, tea sandwiches, salmon & out of this world pastries. 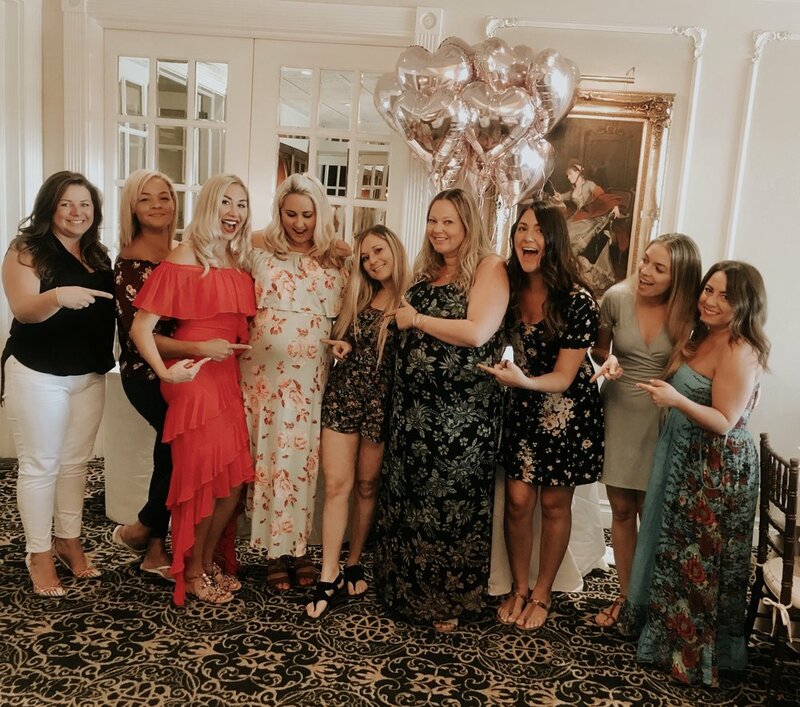 We played a few different games including emoji baby shower Pictionary, guess mommy's belly size with ribbon, memory - baby shower edition & everyone filled out baby predictions and advice for the mommy to be! Brianne also opened gifts and we cut and ate that DELICIOUS red velvet cake.